Did Cabinet Seize Charity Money to Satisfy Casino Demands for Retractable Roof? For two years the BC public and charities have wondered why the government took the stunning and inexplicable step of clawing back tens of millions from BC charities in one year alone, and seizing some $200 million more over 6 years. But today it’s all clear. 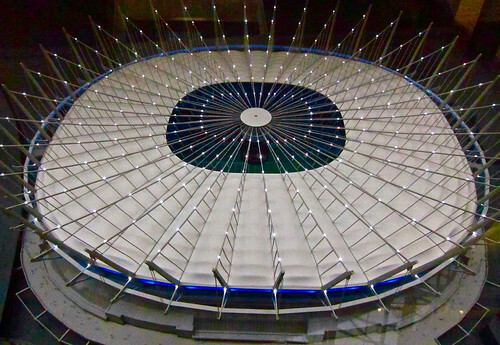 The BC government diverted hundreds of millions of dollars from charities and non-profits that we could have a retractable roof on BC Place Stadium instead of a dome replacement. It’s clear from the timeline. In the summer 2009 the BC Cabinet had a very serious problem. Their original $150 million estimate to build a retractable roof on the stadium was spinning out of control–in a single year it had more than doubled to $400 million and was growing rapidly. Clearly, more responsible options had to be considered. But the Las Vegas based Edgewater Casino owners, Liberal donors and insiders who hadn’t finalized their own deal with PavCo, wanted nothing to do with government fiscal responsibility. They wanted a retractable roof, and they played serious hardball to get it. Anything else was a deal-killer to them, and they made that crystal clear. Where was the money to come from to satisfy the Edgewater Casino demands for an incredibly costly roof? Rich Coleman was the minister responsible for the BC Lottery Corporation, the casinos and also for gaming grants. If the PavCo Edgewater deal was to survive, Rich Coleman had to be part of the solution. This was the context in which Coleman moved in the summer of 2009 to claw back $36 million already committed to BC charities and cut them off from access to over $200 million over the next 6 years. Today, more than two years later, as charities and non-profits across the province get ready to close, the roof opens on BC Place Stadium. In May 2008, when the retractable roof was originally proposed, all-in costs were pegged at around $150 million. By November ’08 those projections had soared to $365 million. In the spring and early summer of 2009 PavCo called for proposals to develop the BC Place lands. Paragon Gaming, the owners of Edgewater Casino and two other small market casinos in northern Alberta, submitted a bid to build a mega-casino complex onto the stadium. While that bid was under consideration, Paragon shareholder and board member T. Richard Turner, himself the former Chair of the BC Lottery Corporation, wrote a $50,000 cheque from his family company to the BC Liberal party for its May election campaign. Mr. Turner had purchased shares in Paragon Gaming while still the Chair of BCLC, resigning from that board only months before Paragon’s purchase of the Edgewater Casino. A month after the Liberal victory, Paragon was selected as the winning bidder, and began negotiations with PavCo to finalize terms. Faced with a balking cabinet, Turner placed a call to Kevin Krueger’s private cell-phone, saying that Paragon considered its deal with PavCo “conditional upon a retractable roof,” and that failing to build one was a “deal-breaker”. The province had to call Turner’s bluff or find cash quickly. In July 2009 Rich Coleman, minister responsible for social housing, BCLC and charitable gaming grants suddenly made what seemed then like an inexplicable move. Without warning he seized $36 million already committed to BC charities’ budgets from their legal entitlement to gaming proceeds. With the stroke of a pen Coleman slashed grants to charities to pre-1995 levels, instantly securing just over $200 million from the charities’ gaming entitlement over 6 years. Almost exactly the amount needed to meet Paragon’s demands for the retractable roof. By fall 2009, events were moving quickly, but PavCo’s deal with Paragon was still not finalized. BCLC CEO Michael Graydon’s diary discloses that he brought Paragon VP Dennis Amerine before Treasury Board on October 1, 2009, where it appears yet more hardball was played. On October 29, 2009 the province approved a budget for the BC Place roof, upgrades and temporary stadium of $575 million, almost 400% greater than the figure announced a mere 18 months earlier. PavCo went ahead with construction in May, 2010, without even waiting for Paragon to get their approvals. We may never know why PavCo and Paragon were so confident that City Council would agree to a massive casino expansion, but gaming minister Rich Coleman’s dual responsibility for social housing may be a clue. Was there a tacit or explicit expectation that funds for social housing were linked to approvals for the Edgewater expansion? Is this why city staff’s initial public consultation only notified residents within 2 city blocks of BC Place? Why did almost no one in the city understand what was happening until a citizen’s group brought it to public attention? Why was this application so shrouded in mystery? Whatever the true facts are, it is clear that charities and taxpayers are contributing hundreds of millions because of pressure from a casino partner that then failed to meet its own end of the bargain, and that . Hundreds of BC charities and community groups across the province have quietly stopped serving their missions, or are near collapse. The Kelowna Women’s Resource Centre has closed, the Vancouver Children’s Festival is near failure, and the Museum of Vancouver and the Playhouse had to be bailed out by Vancouver taxpayers. In the last 3 years BC charities have lost almost $100 million in gaming entitlements, destabilizing an entire employment sector responsible for 2.5% of the province’s GDP. Vital services freely available to the public, such as transportation of sick children to treatment, assistance for brain injury survivors, counseling for seniors and immigrants have been cut back or eliminated. There is no telling how many jobs have been lost, but they certainly number in the thousands. It goes without saying that entire system of charities and gaming demands a complete overhaul. More prudent stewardship of the public purse would have saved those jobs and services and still got a perfectly good roof built for our teams. Party insiders and cronies, backroom deals conflict of interest by those in positions of trust, the pushing around of small charitable organizations to get at their cash, and wild extravagance with the public’s money.